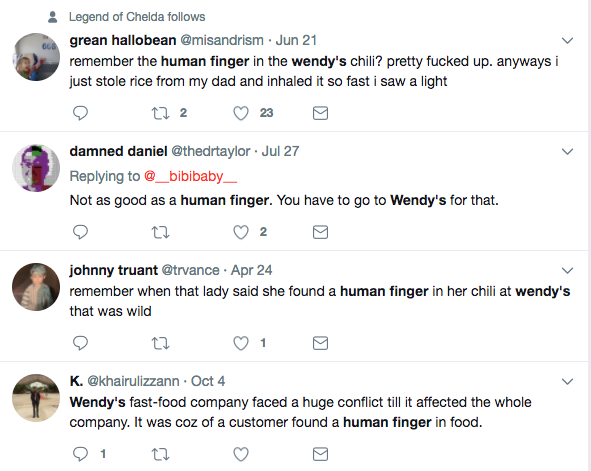 Woman Finds Severed Human Finger Found in Wendy's Chili-Fiction! - Truth or Fiction? Woman Finds Severed Human Finger Found in Bowl of Wendy’s Chili-Fiction! Rumors that a California woman found a severed finger in a bowl of Wendy’s chili have been circulating for years. A California woman falsely reported that she found a severed human finger in Wendy’s chili in 2005, and people were still referring to the infamous “Wendy’s finger chili” 12 years later, in October 2017. The hoax unfolded in March 2005. At the time, the San Fransisco Gate reported on the incident in a story appearing under the headline, “Wendy’s diner finds human finger in her chili.” The report failed to clarify that health officials had not actually confirmed the finger was found in the chili — and health officials later found that the woman had planted it there. The legend of the Wendy’s finger chili was born. Publications around the world picked up on the sensational headline — but, by January 2006, the woman and her husband admitted that got the severed finger from a co-worker who lost it in an industrial accident and planted it in the chili in an extortion scheme, the New York Times reports. Ayala was later released early on good behavior, and she opened up about the Wendy’s chili finger incident in an interview with a local news station. Summarizing that interview, NBC Bay Area reported that Ayala apologized to Wendy’s and explained how she carried out the hoax: “I cooked it,” Ayala said of the severed digit. During the interview, she said she prepared the piece of ring finger at her Las Vegas home then drove it to San Jose, where she dropped it into the chili. It’s been widely reported that the Wendy’s chili finger incident cost the franchise $21 million in lost business . And, as is often the case with sensation headlines like this one, many readers remember the initial chili finger report but not follow-up reports that it was a hoax. Social media users continue to perpetuate false reports that a finger was found in a bowl of Wendy’s chili. There are, however, plenty of credible reports of human fingers being found in food. A finger was found in an Arby’s roast beef sandwich in 2004, a finger was found in frozen custard served at a Wilmington, N.C., ice cream stand in 2005, and a finger was found in a TGI Friday’s burger in 2006. In all of these cases, the severed finger was traced back to a workplace accident. "The Enemy Among Us" Commentary By Charles Krauthammer- Incorrect Attribution! Creepy Clown Arrested in Haunted House Massacre, 18 Dead-Fiction!